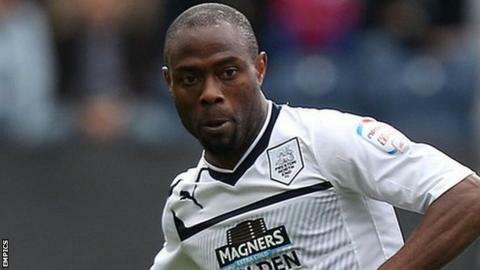 Akpo Sodje struck twice on his home debut to help Scunthorpe defeat Portsmouth and move out of the League One relegation zone. Sodje broke the deadlock, heading in Callum Kennedy's left-wing delivery at the near post. However, Liam Walker pulled Pompey level when he drilled a superb 30-yard free-kick into the top corner. But Sodje finished from another Kennedy cross on 85 minutes to earn the Iron only their second home win this season. Sodje's late strike means Portsmouth have now lost their last eight league games, and lie eight points away from League One safety. "Credit to the players because they didn't play well today. "It was probably one of our worst games in terms of a batch of games in the New Year, but I think the steeliness of the side and the belief to keep going is important to us at this stage of the season, because wins are wins and we've got to get them. "We know that we weren't as good as we have been and many a player weren't at their game, but you've sometimes got to scrap them out and maybe that's payback time for the performances we have put in and only got a draw. "The importance of this first win is massive - this was a massive game for both clubs, a huge game and it's not easy. "